Authority Pro theme looks great. But figuring out how to set it up can be confusing. Here are some important points to help you get started. A lot of sites use custom fields, so later versions of Gutenberg might or might not solve this problem, we’ll have to wait and see. 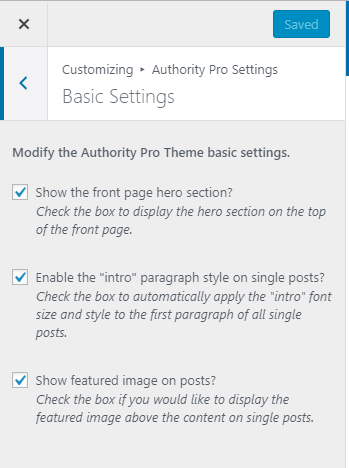 Authority Pro Settings (this leads to four sub tabs). We’ll go through the tabs one at a time. Enable or disable the “Hello I’m Melissa” hero text and photo. 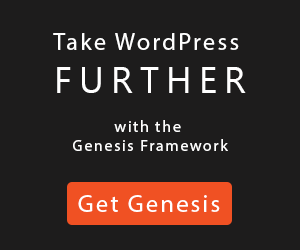 Enable or disable the fancy first paragraph on single blog posts. Enable or disable the large featured image that sits just under the eNews widget at the top of single posts. The first tick box enables the hero section at the top of the front page. 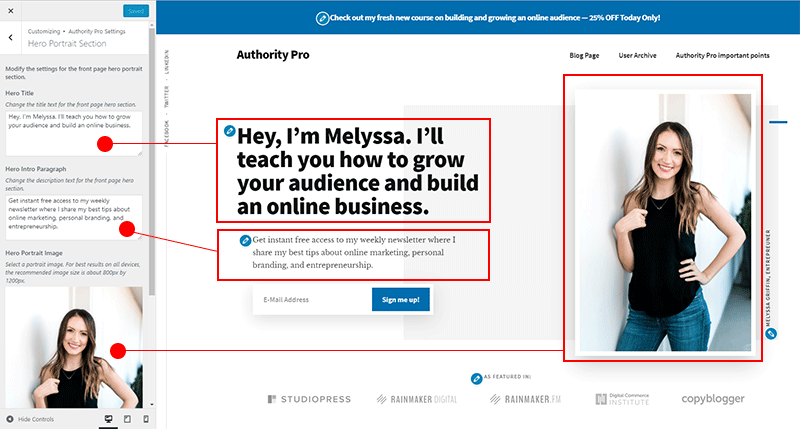 In the demo site this is the section with the photo of Melyssa and the big headline. 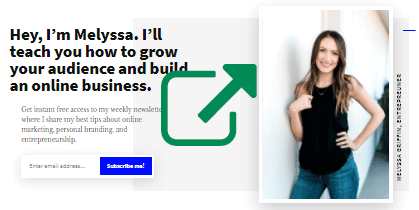 I’ll show you how to customize this section by adding your own photo, headline and text. Later on in this tutorial. The second tick box automatically styles the first paragraph of every blog post with a larger font size in italics. 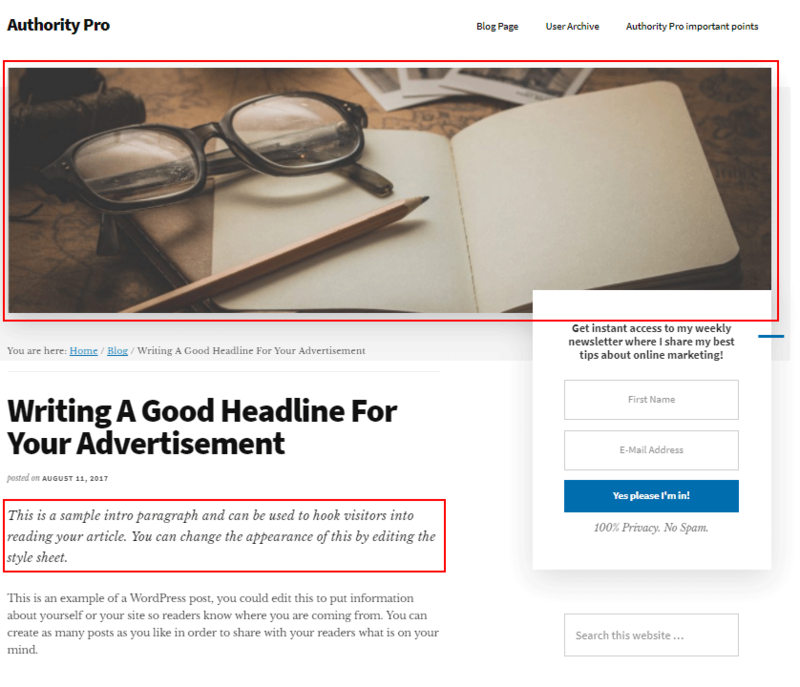 The third tick box tells WordPress that, if a featured image is applied to a blog post, that featured image should be displayed at the top of the post. The image spans the full width of the content and sidebar area. 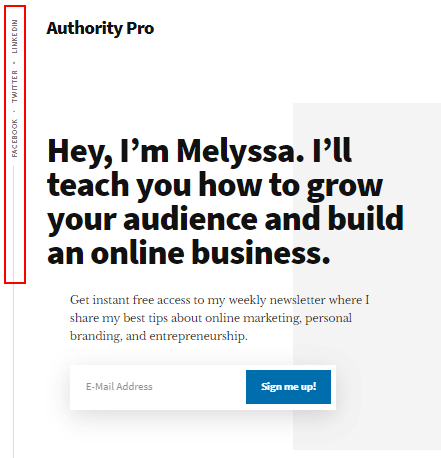 Or view the online demo of Authority Pro theme. Top Banner. This is the blue dismissible banner at the top of every page. Using the Hero Portrait section is a two step process. First, in Basic Settings, you enable the Front Page Hero Section. Only then will the Hero Portrait Section becomes available. We did this first step earlier in this tutorial, but here’s a quick recap. Dashboard > Appearance > Customize > Authority Pro Settings > Basic Settings: Show the front page hero section. 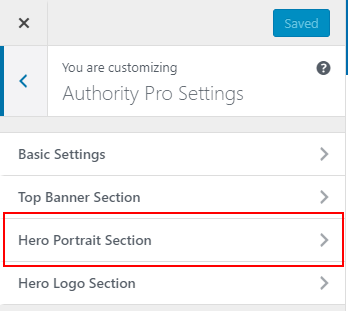 Dashboard > Appearance > Customize > Authority Pro Settings > Click Hero Portrait Section tab. Please Note: to change the caption text for the photo, scroll to the bottom of the customizer. You have to look carefully to find the section labeled “Hero Portrait Caption”. The Hero Portrait Section also contains an image chooser. So you can replace Melissa’s photo with an image of your own choosing. Here you can upload up to six logos. 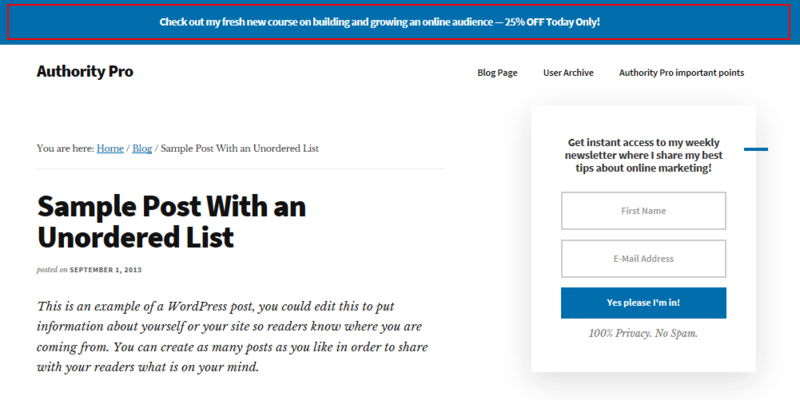 The demo site uses StudioPress and Copyblogger logos etc. But you could put logos here that represent your portfolio or businesses you’re associated with. The next tab we’ll discuss is Customizer > Content Archives. The Content Archives settings let you customize the blog layout. You can also choose a grid or list layout for categories and tag archive pages. 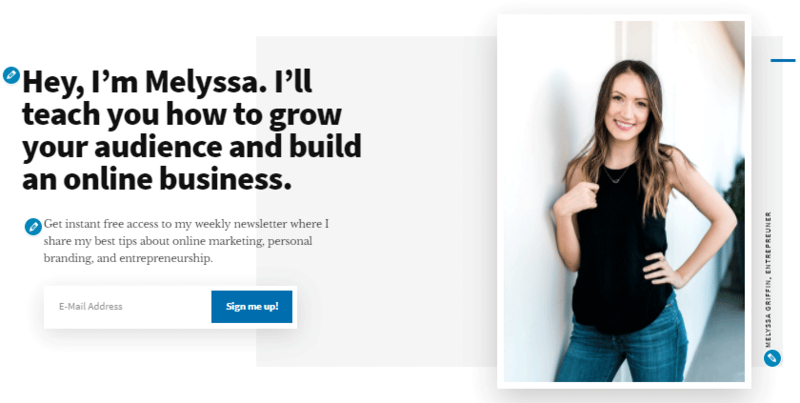 Although the category listing pages can be set to display in a grid layout, the blog page can NOT be set to a grid layout. The Hero Section widget area is used in the demo site to display the eNews Extended widget. 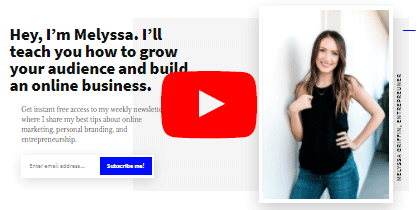 This displays in the demo site at the top of the home page in the “Hey, I’m Melyssa” section. Are two completely different things. So beware, because they sound confusingly similar. Front page 1, 2, 3, 4 and 5 widget areas are flexible. They have a pale grey background colour that only displays when you use the image widget. The Front Page 1 widget area in the demo site uses a text widget. The light grey down arrow will automatically appear above any content you place in this widget area. There is a very subtle pale grey background color which only shows if you use the image widget. If you don’t use the image widget, the background color does not appear. Many of the front page widget areas are flexible. So the layout will change depending on how many widgets you place in any specific widget area. I highly recommend that you experiment with these widget areas and see what layouts and designs you can come up with. The text widget uses Genesis Column Classes to divide the widget area in half. The button is a simple text link with a class of button. The code, if you need it, is available from the StudioPress site where you log in to download your theme. The image below shows the settings I used for the Genesis Featured Post widget. You could use these settings or choose your own. The Footer widget area is a pale grey bar that displays on all pages and all posts. The demo site uses a text widget in this area. The text reads “Ready To Take Your Next Step” and is followed by two big bold buttons. The buttons are simple text links with classes of button and primary. The After entry widget area is not used in the demo site. 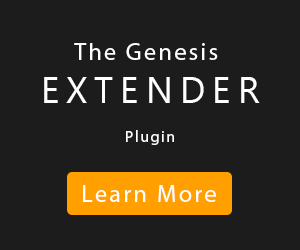 However, it has built in styling for the Genesis eNews Extended plugin and would be a great place to put your Mailchimp signup box. The Authority Pro theme demo has a page displaying some good looking pricing tables. These pricing tables are built from basic HTML. So to use the pricing tables in your own site you’ll need a basic understanding of HTML. 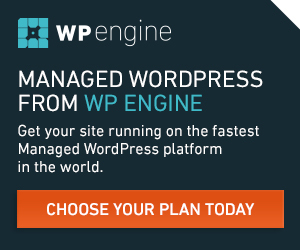 You don’t need to be a HTML expert to use the pricing tables. But you will need to carefully read through the code so that you can change the text and prices etc. The copy and paste code you need to make the pricing tables can be downloaded from inside your StudioPress account. You can get a good idea of how HTML works on one of my other web pages. The social menu displays vertically at the top left hand side of your website. You build the menus in the normal way. You can include pages or posts from inside your own site, or custom links to any web page on the internet. In the Edit Menus dialogue, make Custom Links to your Facebook and Twitter pages and then add those links to your menu. Next click the Manage Locations tab and select your new menus from the drop down lists.